Especially on Friday, riders had to decide whether to push or play it safe. One rider who had little choice but to push was Toby Price. 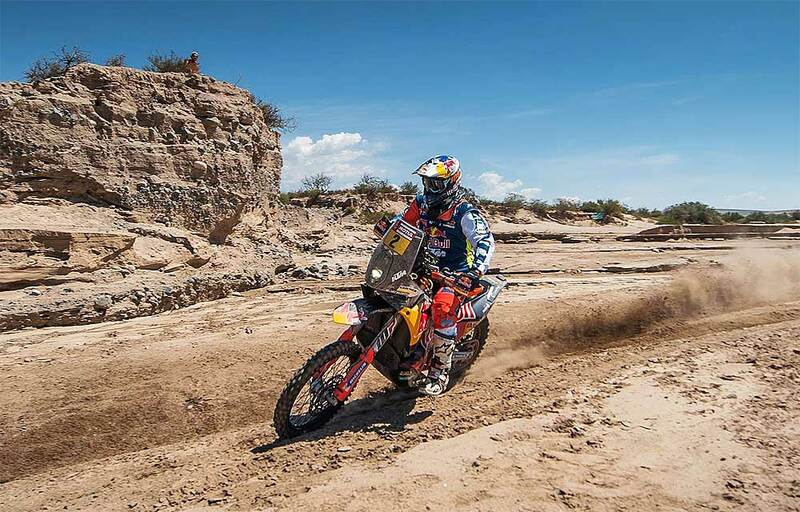 After losing time on SS10 through a navigation error, the Australian KTM-pilot had to take every opportunity he could to make up time on the leaders. With his win in SS13, Price closes in on second-placed Kevin Benavides, but still trails his team-mate and leader of the rally Matthias Walkner by over 27 minutes with one stage remaining. "That was a great stage, I was leading from the front and it was really good fun," said a happy Price. "The tracks were fast, and rough in places so I pushed on as much as I could in those sections. Navigation wasn’t too difficult, I made a couple of mistakes along the way but nothing huge. There were a lot of speed zones so you had to be careful not to overdo it there, but I did what I set out to do and won the stage. It would have been nice to take a little bit more time off Kevin Benavides in front, but there’s still one day left. If you’d told me six weeks ago I’d be here fighting for the podium I would have laughed at you. I’m really happy with how things have gone so far." After leading the stage early on, French Antoine Meo was in a close battle for the runner-up position for the rest of the stage. Finally crossing the line in third place, Meo was pleased with his result. The Frenchman now moves up to 4th in the provisional standings, 50 minutes down on the leader. "SS13 was good fun," reported Meo. "I tried everything I could to catch Toby, but he was on the gas. The last part of the stage was really fast and I eased off a little because a mistake there could have been very scary. I’m happy with how the day went, the result moves me up to 4th in the standings and that is what I was aiming for this day. Now we just have one more day to ride so I’ll do my best and hopefully get a good, safe finish." Matthias Walkner continues to ride in the style that has placed him in a commanding lead at the top of the standings – fast, consistent and with the minimum of mistakes. Walkner’s performance throughout the rally has been superb. Taking his time and concentrating on navigation, his fourth-place result in SS13 sees the Austrian go into the final stage with a 22-minute lead over second placed Benavides. 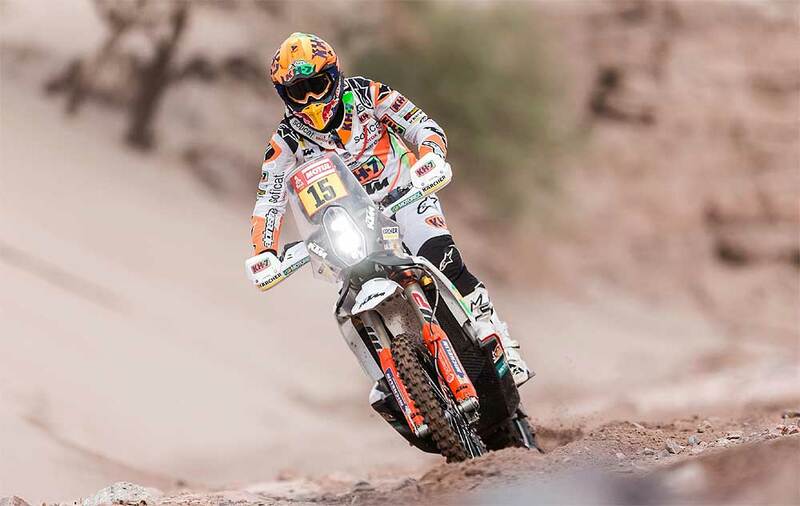 The former MX3 World Champion is now within sight of his first Dakar win. "That was a really long day," the Austrian said. "The guys at the front are pushing really hard and I’m feeling a little nervous so my aim is just to take things steady and get to the line safely. It was a really fast stage and just a small mistake could cause a big crash. I have got a 20-minute gap over the guys behind but even that amount of time can disappear easily if you get lost or have a problem with the bike." Setting off 18th, Laia Sanz immediately fought her way up to 13th place at the first waypoint. Laia carried that position right to the end of the 424km special and by doing so also improved her ranking in the overall to 12th. With just one stage left to ride, Laia is head and shoulders above the rest of the female competitors and will be trying her best to claim a top-10 position overall.